Visitors to Murphy First Baptist Church’s free Monday luncheon often ask this question when they step up to the buffet. If Nurse Judy is there, they tend to make different choices about the food they select for lunch that day. That’s because Judy is a parish nurse at Visitors to Murphy First Baptist Church. On Mondays, Judy makes herself available during the lunch to do blood pressure checks for anyone who walks through the church doors. 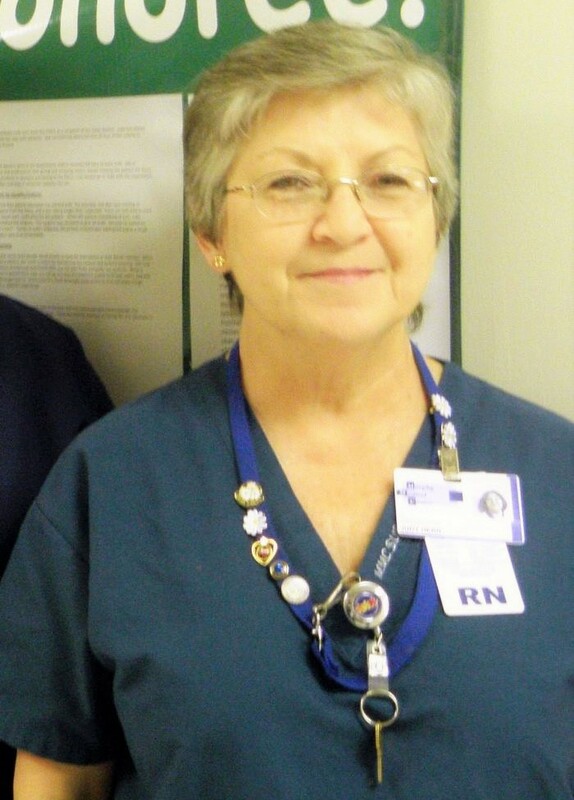 Judy spent many years in nursing, but now she works in community relations at Murphy Medical Center, which serves several MountainWise counties in western North Carolina. Her outreach takes place in parishes and senior centers throughout Cherokee and Clay counties. Parish nursing and community outreach are important to Judy because as she says “some folks don’t get to the doctor regularly at all.” Parish nursing also addresses the whole person: not just physical needs, but spiritual needs too. Helping her community members get their high blood pressure under control is a personal passion for Judy. She knows that high blood pressure puts a person at risk for heart attack and stroke – the leading causes of death in the United States. In 2011, 35 percent of adults in Western North Carolina reported having been told by a health professional that they had high blood pressure, or hypertension. That’s higher than the reported national average of 29 percent during the same time period. Nationally, only 52 percent of adults in the US have their blood pressure under control. To combat this issue, MountainWise is rolling out the CDC’s “Check. Change. Control.” (CCC) program as part of its MountainConnections initiative. On January 8th, 2016 , MountainWise convened community health workers who are interested in reducing hypertension to learn about the program. Judy found the convening serendipitous. The CCC program provides an app where people can regularly log their blood pressure readings. If someone’s numbers are too high, a community health worker like Judy can step in to support that person in getting back on track. Judy does not foresee the CCC program and its app replacing any of the personal touch she brings to her outreach. Judy says her success in working with people to reduce their high blood pressure is because of the trust and rapport she’s developed with her community. Her secret? It’s simple really. She just listened to the people who took the time to get their blood pressure checked, and cared about them. The same people who ask “Is Judy here today?” go to her for nonjudgmental guidance and coaching when they need it. Are you a health professional committed to reducing high blood pressure in Cherokee and Clay Counties? MountainWise will roll out the Check. Change. Control. program in March of 2016. If you’re a health professional or community health worker in Cherokee, Clay, Graham, Haywood, Jackson, Macon, Swain, or Transylvania counties in North Carolina, contact us today to be a part of our program. Image of Judy Herr is from the Daisy Foundation website.